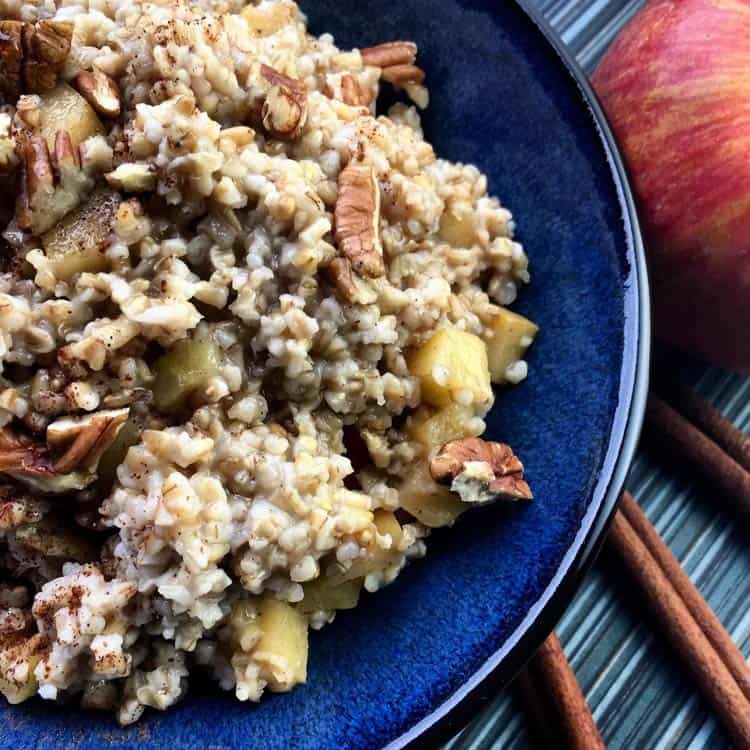 If you want to wake up in the morning with your house smelling like apple pie, try this Slow Cooker Apple Cinnamon Oatmeal recipe. When the days get short and the air gets cold, we all crave warm, comforting foods that warm us up from the inside. We don’t want smoothies, ice cream, iced coffee, or anything straight from the fridge really. We want soups, oatmeal, chili, hot chocolate… just about anything warm. This is especially true in the morning. Who wants to crawl out of bed, far away from our warm blankets, and walk into a (probably chilly) kitchen and eat something cold? No way. If anything can get us out of the warmth of our bed in the morning, it’s the promise of a warm and comforting breakfast. Even more appealing is a recipe that we can prepare the night before and wake up to, ready to eat. If it were spring or summer, a perfect recipe would be overnight oats — oats mixed with milk and yogurt, left in the fridge overnight to fluff up. Chilly overnight oats will definitely not do in the winter (unless you keep your house very, very warm). 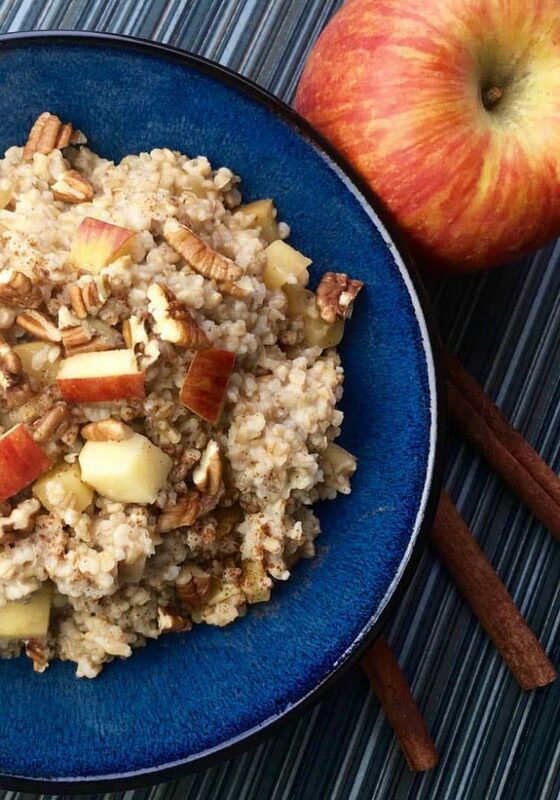 But how about a bowl of this warm Slow Cooker Apple Cinnamon Oatmeal? 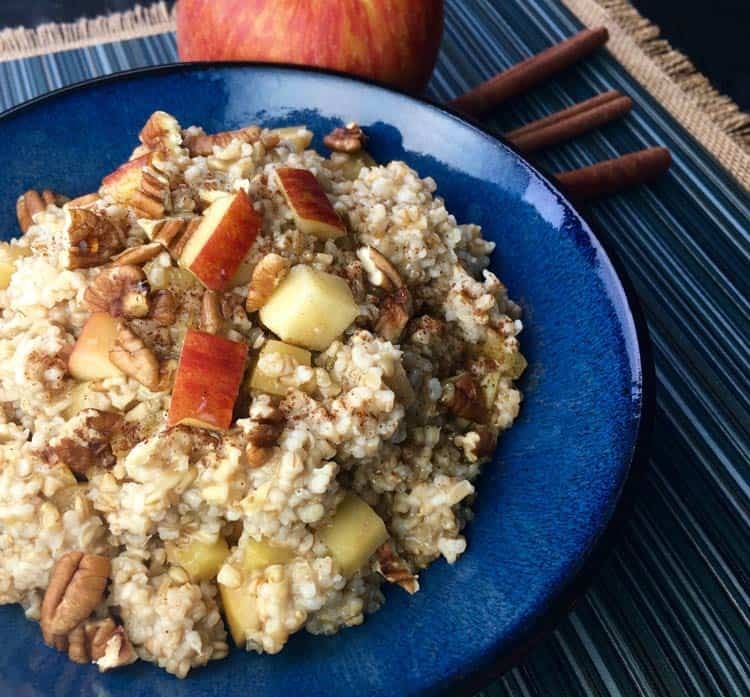 Slow Cooker Apple Cinnamon Oatmeal tastes just as amazing as it looks. Steel cut oats, apple cider, apples, honey, cinnamon, nutmeg, and allspice, topped with chopped apples, pecans, and maple syrup. This recipe is so good that you might wish it were winter all year long! What’s especially great about Slow Cooker Apple Cinnamon Oatmeal is it doesn’t take long to make. Well, it takes a few hours… but you don’t have to be there for most of the process thanks to the convenience of using a slow cooker. All you need to do is grease your slow cooker crock (to prevent the oats from sticking) or use a slow cooker liner, throw all the ingredients in, and turn it on low for six to eight hours. That’s it. When it’s ready in the morning (or whenever you decide to make it), open up your slow cooker, top each serving with chopped apples, pecans, and (optional) maple syrup, and enjoy. You might even get to sleep in a few extra minutes thanks to the speediness of this recipe! Note that this recipe uses steel cut oats, not quick oats or old-fashioned rolled oats. The cook time for this recipe is specific to steel cut oats, so please don’t substitute another type of oats because you’ll end up with a mushy, overcooked mess (not the best thing to wake up to in the morning). But you might be wondering: why steel cut oatmeal? Steel cut oats are minimally processed. They’re really just the whole oat groat cut into two or three pieces. This makes them heartier and chewier (in a good way), and that also makes them perfect for slow cooker oatmeal. Thinner, more processed oats wouldn’t hold up to such a long time in the slow cooker. If you’re wondering about steel cut oatmeal nutrition facts, they’re basically the same as rolled oats. However, one difference is that steel cut oats have a lower Glycemic Index (GI) score, meaning they won’t spike your blood sugar as much when consumed. Want More Slow Cooker Oatmeal Recipes? If you think this Slow Cooker Apple Cinnamon Oatmeal recipe looks good, make sure to check out my recipe for Overnight Slow Cooker Hot Chocolate Oatmeal! If you’re just a huge oatmeal fan, you might also like our Baked Oatmeal recipe. It’s another healthy and yummy oatmeal breakfast recipe. Prepare Slow Cooker Apple Cinnamon Oatmeal the night before and wake up to a house smelling like apple pie! To your slow cooker, add all ingredients (except for those listed under "toppings") to a lined or greased slow cooker. Stir to combine. Cover and cook on low for 6 to 8 hours. The actual cooking time will vary depending on the slow cooker you use, so it's preferable that you check for doneness after 5 hours and adjust accordingly. After cooking is complete, allow oatmeal to cool slightly. Serve oatmeal topped with fresh, chopped apples, pecans, and maple syrup (if desired). The cooking time is based on the usage of steel cut oats. Do not substitute steel cut oats with any other type of oat. It's critical to grease or line the inside of your slow cooker crock before you place ingredients in the slow cooker. If you don't, the steel cut oats will stick to the side of the slow cooker crock.